Running with Zithers........: Be, Sing and Play the Change you want to see in the world ...or Australia! Be, Sing and Play the Change you want to see in the world ...or Australia! The most rewarding aspect for me is to witness the change music makes. Never will I tire of the sparkle in someones eye, or the look of delight on a face when realizing that they can sing or play a song. Music has power, power to sooth, heal and motivate. It even motivated a zither student to write poetry but music's greatest power is the power to bring about change. Be it a change of circumstance, spirit or awareness. This is why we are proud to support the wonderful work of Playing for Change. However, through an articulate article, published in 2 of our local paper, I was made aware of the need for change, right here in the lucky country. Louise Brown, a music teacher and leader of several community choirs, raises the possibility to bring about change through music and music making and we would like to support her vision of bringing about change through her Songs for Freedom concert. For the next 12 months, Running with Zithers' support for Playing for Change will go toward Louise's Songs for Freedom concert, allowing us to play for change locally. As an Australian citizen, I am appalled at our Governments policy towards Asylum Seekers and believe their current treatment of refugees to be immoral, unlawful and wrong! As a mother, I am also disgusted and ashamed at our mandatory off-shore detention Centres and the subsequent persecution of men, women and children who come to our country in desperate need of compassion and support. These injustices are being repeatedly committed (in my name and in the name of all Australians) by our elected leaders who inflame negative emotions by dehumanizing asylum seekers by referring to them as “queue jumpers and illegals”. Cruel mandatory detention must end. The boats will never stop. The least we can do is to process them quickly and develop a more humane system which is ultimately more affordable and sustainable. Ideally, Australia should lead a reform of the international system for assisting and protecting refugees. Realistically, our leaders seem to lack the moral courage necessary to do this and it is up to us as a people to make this change. The concept of having a democratically elected Government which then goes on to silence our Doctors and journalists with threats of imprisonment if they dare tell the truth is ludicrous! What are they hiding? Obviously it is time for us as a community to stand up and fight for those who have no voice. Could more public compassion have saved the Jews of Europe from Hitler? Surely history has taught us something. Cardinal Pell’s disappointing response to the abuse which occurred within the Church was that he was “not aware”. I can claim no such thing with the inhumane treatment of our Asylum Seekers. I have read the papers, witnessed the growing refugee crisis in Europe, followed the news regarding the ‘Tampa Saga’ and watched the deteriorating mental health of those incarcerated in off-shore detention facilities as evidenced by the latest news of a 21 yr old Asylum Seeker setting herself on fire. Enough is enough! It is time to come together as a community and stand up for what is right. In remaining silent and doing nothing, I realize I am in fact, seen to be accepting of our Governments policy which inflicts willful cruelty on those in desperate need of help. Australians do have a conscience and the many ‘Refugee Alliance groups’ within the Surf-Coast and Colac/Otway Shire are evidence of this. I am not a politician, doctor or social activist; however I am part of this community and believe that we can come together as a people to make a change for the greater good. I propose that by using music as a tool, it is possible to facilitate greater acceptance, tolerance and understanding of Asylum Seekers by uniting and putting on a mass Choral Concert in our region named “Songs of Freedom”. This would involve our community linking up with the refugees from Colac/Geelong and presenting a one-off music performance using social justice songs to promote our cause. Currently working on this concept with the ‘Winchelsea Refugee Support Group’, I am at present conducting drumming/ music workshops through Diversitat with the Sudanese community and other ethnic minority groups. 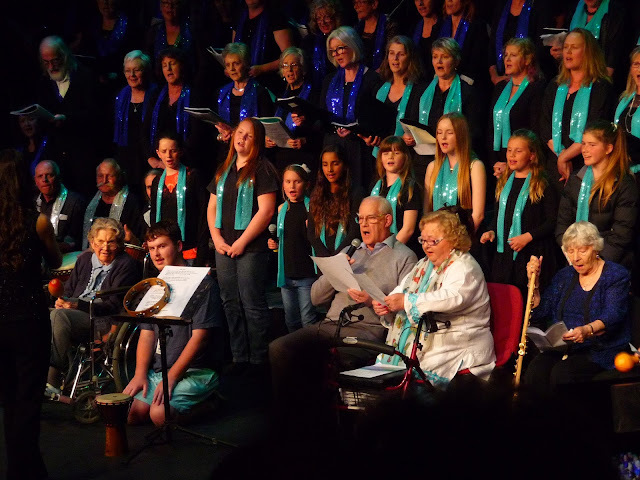 Having witnessed first-hand the benefits of music and singing through our local Birregurra Arts Group, Primary School Choir and OMM Choir, I realize that we as a community do have a ‘voice’ and it is time to use this to promote harmony, unity and come together to take a stand and for those who have no voice. The “Songs of Freedom Concert’ is being planned for early 2017 with rehearsals set to commence later this year. Currently sponsorship and support is being sought to help bring this idea to reality… an idea in which music will be used to do what words cannot and that is to bring about change which will hopefully one day make me proud to be an Australian.